There is a picture of Ganga Devi coming into the material world. 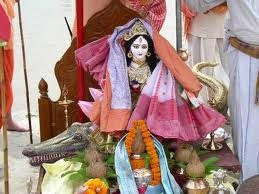 Ganga Devi is depicted as riding on a crocodile… the crocodile is representing the material energy because Ganga comes into the material world. 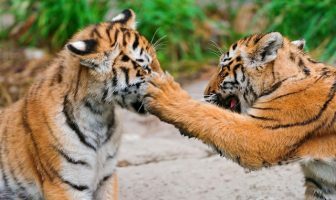 There are many ferocious animals such as tigers. One can train tigers but one can not train crocodiles – crocodiles are treacherous! Crocodiles, one can never trust. There is no such thing as a crocodile being grateful. One can treat him like a pet, mother over the crocodile, give the crocodile lots of affection but the crocodile will still be totally ruthless! That’s the nature of the crocodile. So the material energy is like that also.